Burnley boss Sean Dyche is of the opinion that the whole 'long ball' debate has run its course. The Clarets chief is an advocate of mixed football and a firm believer that all brands of the game serve a purpose. Both Burnley and tomorrow's opponents, West Ham United, have been brandished 'long ball' teams in the past but Dyche doesn't feel that any side in the Premier League is a one trick pony. At this level it's a case of horses for courses, finding a style that will best suit his selection and impact on the opposition. 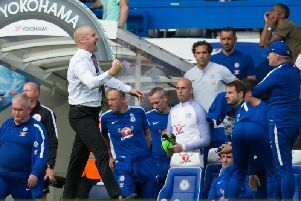 That philosophy has worked against the likes of Liverpool and Everton as the 'longer' game, described by Dyche as 'ramming' the ball down their throats, worked in securing a point at Anfield while the Clarets won at Goodison Park thanks to a goal made from a 24-pass build up. Similarly, the Hammers have the personnel to adapt their design with Andy Carroll, Javier Hernandez, Diafro Sakho and Andre Ayew all offering something different. Looking ahead to tomorrow's Premier League fixture, Dyche said: "There's a good point in case - if you've got Andy Carroll in your side, why wouldn't you use his aerial strength? "It's not about long ball or short ball, it's about coaching a team and players playing in a way that they think can affect the game. "I am a great believer in mixed football. If you only have one way of playing it can make it difficult, it’s hard to make that work all the time. "We are not talking Barcelona here because we had one heavy load of passes. We are trying to say can we flex our muscles slightly differently? Can we use the ball wisely? Can we get the balance? That’s something we are still trying to find. What games do you need it and when do you need it? "That’s player intelligence. I have mentioned a couple of our players who know when to slow it down and when to pick the tempo up. "You will all know the players. Players at Manchester United, Paul Scholes knew when to bring it to life and when to slow it down. It comes with experience." Dyche's argument also suggests that certain players in possession of the ball are more suited and heavily qualified to play - what he prefers to call - a long pass. "I don’t go for the long ball thing," he said. "It’s become a tool to do football down. It does them a disservice. We are talking amazing high quality footballers. The right ball will always be the way forward. "I made a point about Glenn Hoddle - he's the best footballer I ever saw with two feet in my life. Him and Ronald Koeman actually - two players who could fire that ball anywhere. "Imagine saying to them we don't really play 10 yard passes here. It would have killed their games because they had so much ability to play the long pass. "There's still a thrill about the long pass. There's still a thrill about the ball going in to the box and the ball breaking and we're not sure if it's going to be cleared or if somebody's going to score. "Of course the game has moved forward, of course there's some fantastic passages of play now but still the moment of truth is getting the ball and putting in to the back of the net. However that comes around it's still joyous." Dyche, who enjoys the flexibility of football, added: "I don't get Nascar. I feel that really hard to get my head around because they just go really fast around a track a lot. "I find that genuinely difficult. If football was like that where everybody played everything the same then I think it would be a bit boring. "I personally want these different styles and different ways of playing and different groups and different athleticism and size. I think that's good for the game. I think it's gone too far now, particularly at the top level of football. "I've always thought this one - me and my staff laugh about it - in an interview after the game against Man City. I'm asked the question and I say 'well, they're quite frankly a disgrace. "Did you see all those short passes they had? a disgrace!' Imagine that. Everyone always says 'well, they just put the ball on top of us' like you're not allowed to do it. "And yet if you went out and said 'they played 500 short passes'... Let's lose this idea that there's only one way of playing. Football would be so boring, it would be frightening, if everybody played the same way."